Home > Car Care Products > Vacuums & Blowers > Metropolitan Vacuum Cleaner Company > Metro 12 Volt Evolution Hand Vac Free Bonus! Formerly known as the Metro 12 Volt Stainless Steel Hand Vac, the Metro 12 Volt Evolution Hand Vac has an updated look that features a black end cap. It's the same machine it's always been - just with an updated look! 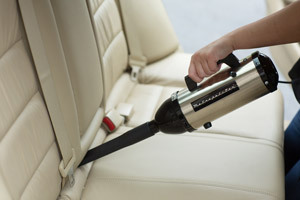 Plug this vac into your vehicle for cleaning on the go! The Metro 12 Volt Evolution Hand Vac is a modern upgrade of Metro's hand vac that they've made since 1957. The Metro 12 Volt Evolution Hand Vac plugs into the cigarette lighter or 12 volt outlet in your vehicle. It's the ultimate in convenience for anyone living in an apartment or condo! Clean up crumbs and small messes quickly around your vehicle with this ultra light-weight vacuum with a horsepower motor. At only 3 pounds, you can pull the Metro 12 Volt Evolution Hand Vac out at a moment's notice without a lot of fuss. The vacuum plugs into your vehicle's cigarette lighter perfect for cleaning on the go! The stainless steel and chrome design makes it both attractive and practical. I store it in the trunk or in the back of the SUV. It's like the high-end stainless steel appliances that are so popular in kitchens nowadays. Sleek and shiny, just like my car. The Metro 12 Volt Evolution Hand Vac is the only all steel high performance handheld vacuum you can buy! The Metro 12 Volt Evolution Hand Vac helps to keep your interior clean and sand-free! At 1/2 horsepower, the Metro 12 Volt Evolution Hand Vac is excellent for maintenance and quick cleaning during the work week. If you're looking for a more powerful vacuum, check out the 4hp Metro Vac 'N Blo Portable Vacuum. Scroll to the bottom of the page for a specially priced combo including the Metro Stainless Steel 12 Volt Hand Vac and a 3 Ft. Flexible Hose. I love this vacuum. I was hesitate to purchase it after reading the review below, but after doing some research I concluded it would be perfect for my needs. I couldn't be happier with the vacuum. While it doesn't have as much power as a 10 hp shop vac or the like, it still has plenty of oomph for sucking up dirt, crumbs, pet hair, etc. I have read that the 12 volt is less powerful than the 110 volt, which is to be expected from a vacuum that relies on a much less powerful source of input. The 12 volt is perfect for me, and it's super convenient to use because I don't have to drag out an extension cord. Extremely disappointed in this product. Suction wasn't powerful enough to pick up lint or dirt from carpet. Better off just using a tape roller.